Date of birth unknown; died 145 B.C. A youth of lowly origin, he was set up as a pretender to the throne of Syria as being the son of Antiochus Epiphanes, in 153 B.C., in opposition to the Seleucid Demetrius Soter. The imposition was aided by his remarkable likeness to the Syrian king Antiochus V., Eupator, son of Antiochus IV., Epiphanes, which resemblance induced many to believe him a son of the last-named. 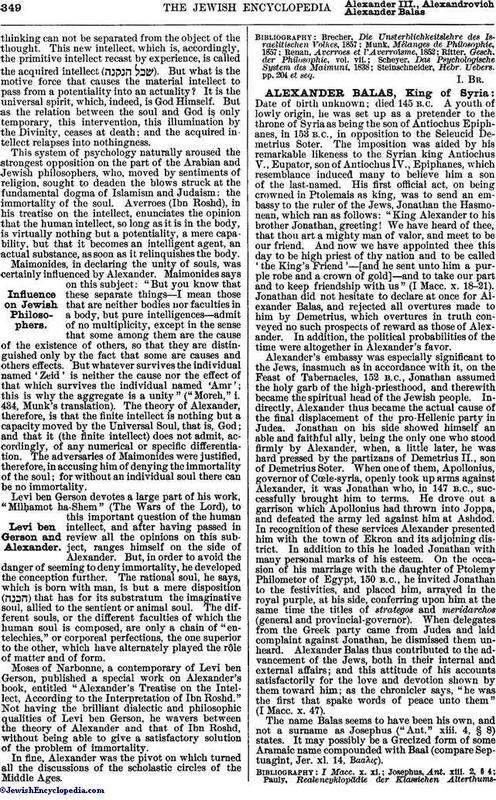 His first official act, on being crowned in Ptolemais as king, was to send an embassy to the ruler of the Jews, Jonathan the Hasmonean, which ran as follows: "King Alexander to his brother Jonathan, greeting! We have heard of thee, that thou art a mighty man of valor, and meet to be our friend. And now we have appointed thee this day to be high priest of thy nation and to be called 'the King's Friend'—[and he sent unto him a purple robe and a crown of gold]—and to take our part and to keep friendship with us" (I Macc. x. 18-21). Jonathan did not hesitate to declare at once for Alexander Balas and rejected all overtures made to him by Demetrius, which overtures in truth conveyed no such prospects of reward as those of Alexander. In addition, the political probabilities of the time were altogether in Alexander's favor. Alexander's embassy was especially significant to the Jews, inasmuch as in accordance with it, on the Feast of Tabernacles, 152 B.C., Jonathan assumed the holy garb of the high-priesthood, and therewith became the spiritual head of the Jewish people. 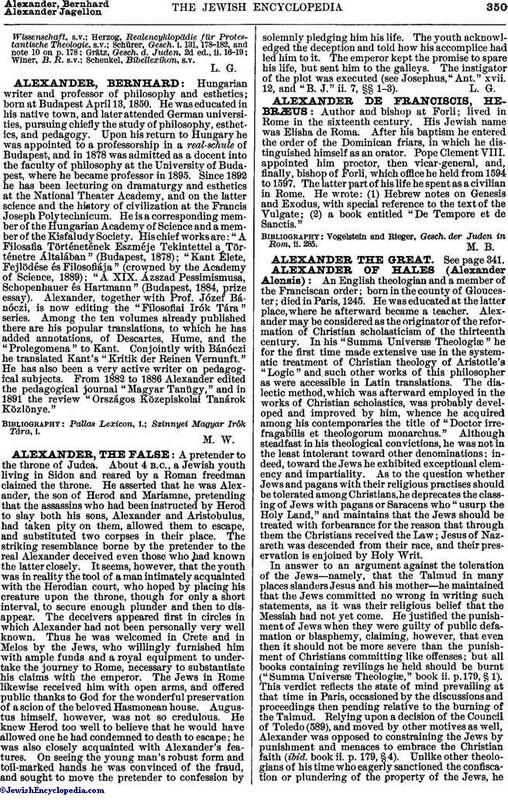 Indirectly, Alexander thus became the actual cause of the final displacement of the pro-Hellenic party in Judea. Jonathan on his side showed himself an able and faithful ally, being the only one who stood firmly by Alexander, when, a little later, he was hard pressed by the partizans of Demetrius II., son of Demetrius Soter. When one of them, Apollonius, governor of Cœle-syria, openly took up arms against Alexander, it was Jonathan who, in 147 B.C., successfully brought him to terms. He drove out a garrison which Apollonius had thrown into Joppa, and defeated the army led against him at Ashdod. In recognition of these services Alexander presented him with the town of Ekron and its adjoining district. In addition to this he loaded Jonathan with many personal marks of his esteem. On the occasion of his marriage with the daughter of Ptolemy Philometor of Egypt, 150 B.C., he invited Jonathan to the festivities, and placed him, arrayed in the royal purple, at his side, conferring upon him at the same time the titles of strategos and meridarchos (general and provincial-governor). When delegates from the Greek party came from Judea and laid complaint against Jonathan, he dismissed them unheard. Alexander Balas thus contributed to the advancement of the Jews, both in their internal and external affairs; and this attitude of his accounts satisfactorily for the love and devotion shown by them toward him; as the chronicler says, "he was the first that spake words of peace unto them" (I Macc. x. 47). The name Balas seems to have been his own, and not a surname as Josephus ("Ant." xiii. 4, § 8) states. It may possibly be a Grecized form of some Aramaic name compounded with Baal (compare Septuagint, Jer. xl. 14, Βααλις).